There are quite a few things that I find wrong with this video, and TransLink’s approach here. I haven’t tried the machines myself; but, Stephen Rees has the best post on the yellow light and click. So, I’m just going to rant about this pathetic video. The first step – as with almost any kind of recovery – is admitting that you have a problem. A video response is no different. Translink has introduced these machines that have made their riders very angry. Clearly state the problem. “We’re sorry that you’re having trouble but here’s how we’re going to get you through this” It’s very Canadian. Saying you’re sorry also means taking some of the blame. Watching the video and reading some of the coverage, I feel like they’re blaming me a bit for not being able to buy a ticket. Who’s in the video? Introduce them. They’re from TransLink. What’s their job title? The main speaker has a penchant for tossing in French phrases. Who are you? Two (non-mic-ed) people are talking behind the camera. Who are they? But, they name the poor guy who designed the machines so he can get hate mail. I believe I first heard this advice from my friends who went to journalism school. Pans and zooms are hard to pull off. Just don’t do them. If you need to zoom in for detail, zoom then frame then focus then record. I don’t care what kind of image stabilization technology you might think your HD video camera has. Put it on a tripod. The people in this video seem to be fumbling-badly. If you want to show someone how to do something, script it so it looks easy. I know that they tried to get this out quickly. But, that’s not really a reason for winging it. This isn’t that seven minute tracking shot at the beginning of The Player. When you’re writing a script, think about how you could break down the video into “scenes.” Cut these scenes together by “editing” it. Scrolling white Times New Roman over a video with a white wall in the background. This is the attempt at step one: admit you have a problem. It’s scrolling, no one can read it. Only do text on a solid background and slowly enough that you can read it out loud. The illegible white text, the representative from the company and the nameless guy behind the camera all talk about the “secret” of the amber light. Aside from sounding like an intriguing Nancy Drew novel, you’re making me feel stupid for not knowing it. There is nothing intuitive about a secret. Watch that video with the sound off. Does any of it make any sense at all? No. Do the deaf take transit and have debit cards? Yes. 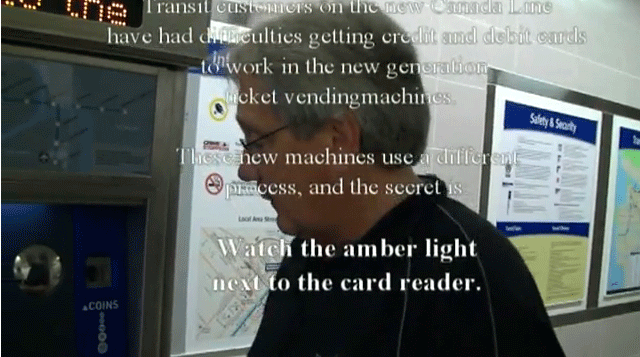 Is captioning a YouTube video easier than using your ticket machine? Yes. Also, if you spent some time writing out the captions for the video, you might realize the need for writing a script in the first place.